Michael Mercier is the founder and President of Screen Education, a non-profit organization dedicated to helping people mitigate the negative consequences of screen addiction, which is tantamount to digital addiction. He holds degrees in Psychology, Marketing, and Information Systems. 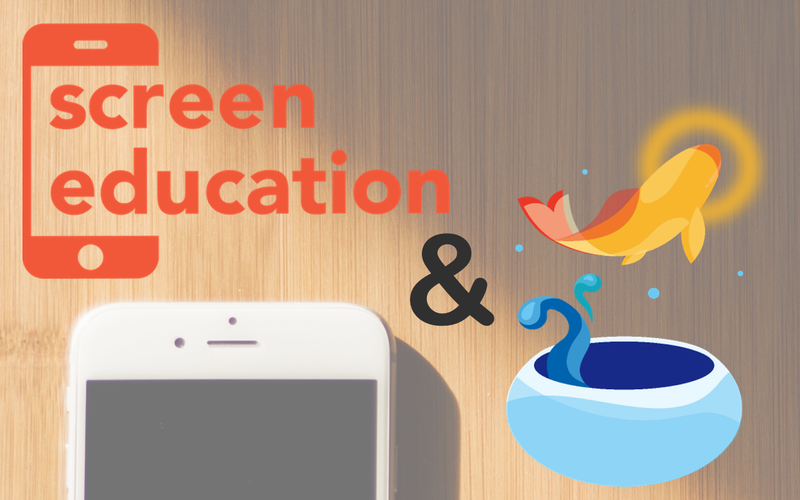 We recently got a chance to chat with him one afternoon about why he founded Screen Education, his work in the digital wellness space, and his personal journey with tech addiction. How did you get involved with the issue of screen addiction? I became aware of the addictiveness of screens as a young child. Once, in third grade, I was watching cartoons with a friend. I asked him a question and he didn’t respond — he just kept staring blankly at the screen as though he were in a trance. I had to shove him several times to snap him out of it. I realized at that moment that TV was addictive. The next year my fourth-grade teacher told us that we should avoid television because it was bad. Because of my third grade experience, this really resonated with me and I followed his advice. To this dayI don’t own a television, and I’ve never regretted this. Many years later I was thrilled to get a smartphone. I love to learn, and I viewed the smartphone as a portable encyclopedia. However, I quickly became addicted to it. I tried for several years to limit my screen time. When I finally realized my efforts were futile, I got rid of the smartphone. I experienced physical withdrawal for three to four weeks. This reinforced for me the powerful draw of screens. As a parent, I saw the negative effects of screens on my children. After they got phones they lost interest in many of their favorite activities and began spending hours at a time staring at their phones. Why did you decide to start a non-profit focused on screen addiction? My own experiences with screen addiction collectively gave me an intuitive sense that it was going to be a huge issue. I felt that I had a deep understanding of the issue and that I could combine these insights with my skills in research and my prior experience in educational publishing to have an impact — by generating insights through research, and educating people about those insights through publishing, public speaking, etc. Our mission is to mitigate the negative consequences of screen addiction. We do this through research, education, and consulting. We work with schools, summer camps, companies, organizations, and consumers. What initiatives have you taken to address this rising issue of tech addiction? In our first two years, we conducted three research studies with teens at summer camps and presented our findings at a conference. However, in the last three months, we have presented at three more conferences, begun conducting qualitative research with schools, participated in several radio interviews, conducted a webinar, and published an Op-Ed piece. We are consulting with some schools. We also have spoken to college kids. What new initiatives do you have planned? We are planning three more research studies, speaking at more conferences, finalizing plans for educational seminars for a variety of target groups, speaking to a human resources organization, and carving out several more initiatives. What are some key findings from your research with summer camps? We are finding that kids already know that there is a problem with screen addiction, and many of them want relief. When they go to summer camps where they are deprived of their phones they really awaken to just how bad their addiction is. They come to fully realize that back home in their daily lives they aren’t getting to know their friends as well, they are wasting too much time on social media and games, and they are robbing themselves of the experience of exploring new activities. They also realize how much better they sleep without a phone next to their bed. How about your research with schools? What we are learning from the schools is that smartphone addiction is a serious problem and is very disruptive to the social and learning environment. But the solution isn’t so simple. There is a very complex dynamic between all stakeholders — administrators, teachers, parents, and students. Members of each stakeholder group hold a spectrum of conflicting views about the issue — and they are strongly-felt views. We feel that we have a model to address the problem, and we will be offering this solution to schools as a suite of services. How do you define digital addiction? I define digital addiction as the compulsive use of screens. It’s the all-consuming compulsion to get online and stay online for endless hours — to the exclusion of other activities you should be doing. Or, it’s the continuous compulsion to use screens while simultaneously engaging in other activities. And it’s doing these things even if you don’t want to be doing them — even if it is driving you crazy but you can’t stop doing them. I think the first step is to make people aware of the problem — to give them the background information, concepts, and nomenclature to intellectually grasp and comprehend the problem. Next is to get them toreflect on their own experience and identify how in their own individual lives the problem is manifesting. Third is to provide them with smartphone deprivation experiences that awaken them to how different life can be without constant screen access. And, the final step is to have them set inviolable rules for themselves in which they will under no circumstances use a screen at certain times of the day, or, when doing other things, such as eating meals, going to bed, or right after you wake up. A great example of institutionalizing this “inviolable rules” approach is Common Sense Media’s #DeviceFreeDinners campaign in which they propose that all families agree that they will not bring phones to the dinner table. Why should people care about tech addiction? Because tech addiction robs you of your life. Our research with teens shows that they realize their screen addiction is preventing them from fully engaging with other human beings, with their surroundings, with nature, with new activities, with learning opportunities, and with the inner drive to achieve and grow. Jean Twenge’s 2017 book “iGen” also laid out very thoroughly the profoundly negative effect that screen use is having on the young. Whether you’re a kid or an adult, this is a terrible way to live. Social media has been under scrutiny these past few months for being a primary cause for digital addiction. What are your thoughts on that? Do you agree? I absolutely agree. I feel that social media, games, and videos are the main problems. As Adam Alter pointed out in his book “Irresistible”, the possibility that yet another dose of social approval or social engagement is coming your way has us endlessly returning social media. Who is ultimately responsible for digital addiction? Everyone is responsible — this is society’s problem. Right now the tech companies are experiencing a backlash because it was revealed in 2017 that they were intentionally engineering apps to be addictive, not caring about the negative consequences for children, yet protecting their own children from them. So they certainly deserve some share of the blame. However, they aren’t solely responsible for this problem. There is something implicitly addictive about certain apps. Even before apps were intentionally being engineered to be addictive people were becoming addicted to them. In 1995 we heard about people becoming addicted to AOL chat rooms. Relative to today that was crude technology, yet still addictive. So even if the tech companies didn’t consciously try to hook people, I believe we’d still have a screen addiction problem. So we all have a responsibility to figure out how to address this societal problem. Have you heard of the term “digital wellness”? What does it mean to you? Digital wellness to me means being in a state of control. It means being able to get online for a brief moment, and then getting off without any hesitation or difficulty whatsoever. It’s being in a state of mind where you are not compulsively drawn to use screens for hours on end. It’s having a “take it or leave it” attitude. It’s essentially being able to put the tech down whenever you want to. When you are recovering from screen addiction you battle with the desire to constantly be on your screens. However, you eventually will hit a plateau and you will no longer feel that desire. That is when you are in control. Michael can be reached via email, [email protected], if you have any questions or want to chat with him about screen addiction. What is Video Game Addiction? What Are It’s Problems and Solutions?